Joseph Summers, Editor of Words of Cheer. Source: Phoebe Mumaw Kolb Photographs, HM4-162. Box 2, Folder 3. 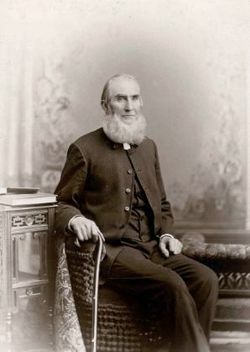 Words of Cheer, a Mennonite Church periodical for children, ages 9-11, was first published in April 1876, at Orrville, Ohio, by Dr. Henry A. Mumaw, editor and founder. It appeared as an 8-page monthly and was intended to reach boys and girls for reading at home. In 1878 the paper was sold to the Mennonite Publishing Company at Elkhart, Indiana, and was edit­ed by Joseph Summers. In August 1892 Abram B. Kolb was appointed as editor. Other editors were as follows: D. H. Bender 1904-8, A. D. Martin 1908-9, H. Frank Reist 1909-12, J. A. Ressler 1912-36, Ellrose D. Zook 1936-49, Elizabeth A. Showalter 1949- . In 1908 the paper was sold to the Mennonite Pub­lishing House, Scottdale, Pennsylvania, the first issue of the new owner appearing 26 April 1908. In 1892 the format was enlarged but the pages were reduced from eight to four. The paper contains stories, arti­cles, poems, puzzles, and children's letters. It was il­lustrated and occasionally appeared in two colors. Beginning in 1951 the paper was enlarged to 8 pages and reduced in size to 8 x 10.75 in. Its circulation in 1958 was 26,750. Zook, Ellrose D. "Words of Cheer (Periodical)." Global Anabaptist Mennonite Encyclopedia Online. 1959. Web. 26 Apr 2019. http://gameo.org/index.php?title=Words_of_Cheer_(Periodical)&oldid=131266. Zook, Ellrose D. (1959). Words of Cheer (Periodical). Global Anabaptist Mennonite Encyclopedia Online. Retrieved 26 April 2019, from http://gameo.org/index.php?title=Words_of_Cheer_(Periodical)&oldid=131266. Adapted by permission of Herald Press, Harrisonburg, Virginia, from Mennonite Encyclopedia, Vol. 4, p. 978. All rights reserved. This page was last modified on 23 March 2015, at 18:39.